Here we are just about to cross over into the new year! If you are like me you're probably asking yourself where this past year went! You may also like me be reflecting on the past year, and thinking about what is to come in the year 2013. In the past I've had trouble with the concept of resolutions. But this year, I think it would be good to set some personal goals and write them down in order to achieve them. Having said that, I've come up with a project that will enable me to capture my "New Years' Resolution" and display it in my studio as a constant reminder. 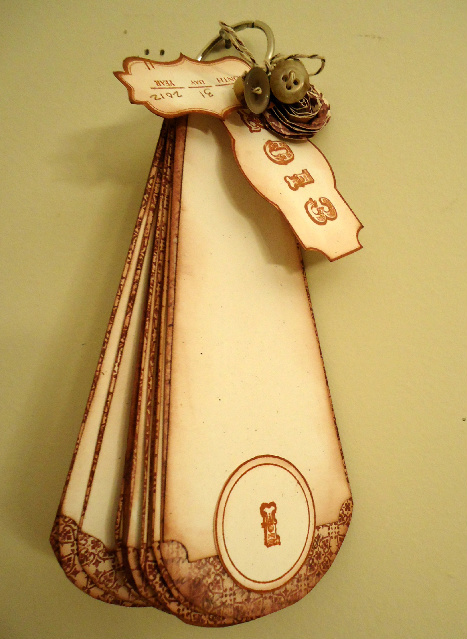 Inspired by the dresden quilt template - I came up with this unique tag book I can write 10 goals or resolutions I'd like to achieve in the year 2013. I'm limited on tools as I'm still visiting with family for the holidays - so I used our Card Labels stamps to create the top of the tag - and the curve at the bottom. And connected it with angled straight lines. Once it was cut out I had my pattern! The print layer behind I used the large oval to get the curve and again once I had my pattern traced and fussy cut out the rest of the 10 tags. 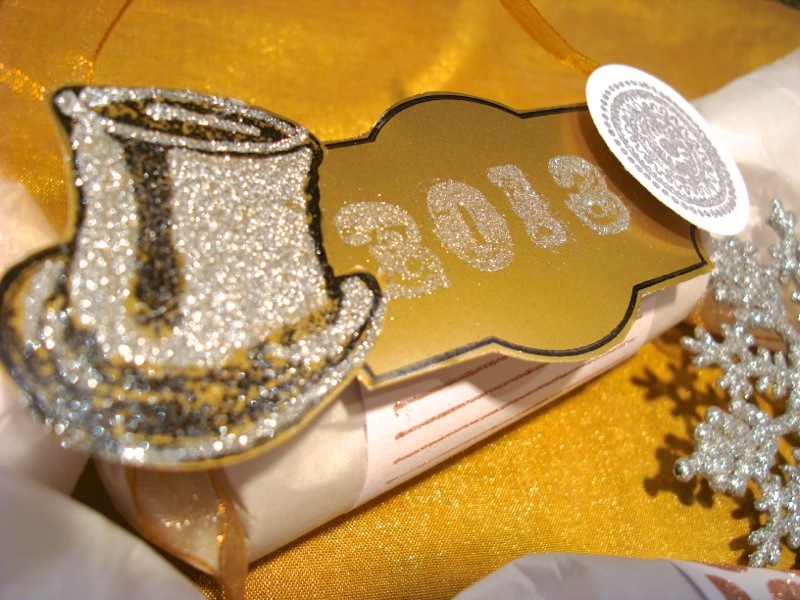 I made tags to announce the year, and date stamp when I created my book. For added fun, I rolled a rose - and tied twine with buttons to the ring. 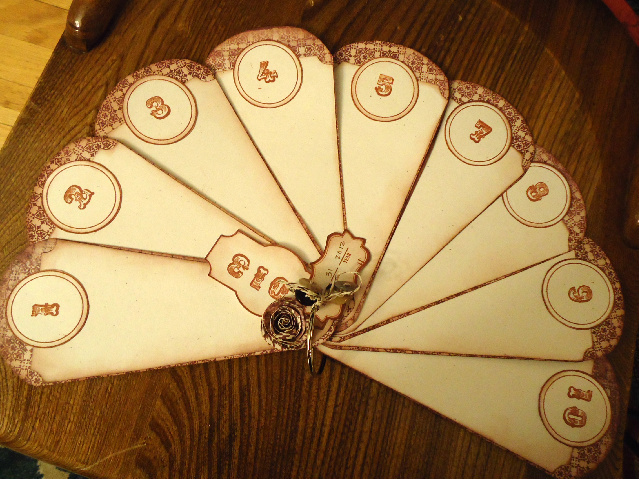 I used Card labels set again along with the new release Remember the Moments. I punched a hole and joined them all together along with the tags on an 1 1/2" office ring. I don't have my Resolutions on here yet, but have started my list and plan to work on them before the New Year begins. What are you plans and goals for 2013? Jen here with a fun little project to help make your New Year's festivities fun! I love those candy poppers that they sell in the store but you don't have to shell out any moola for plain poppers. 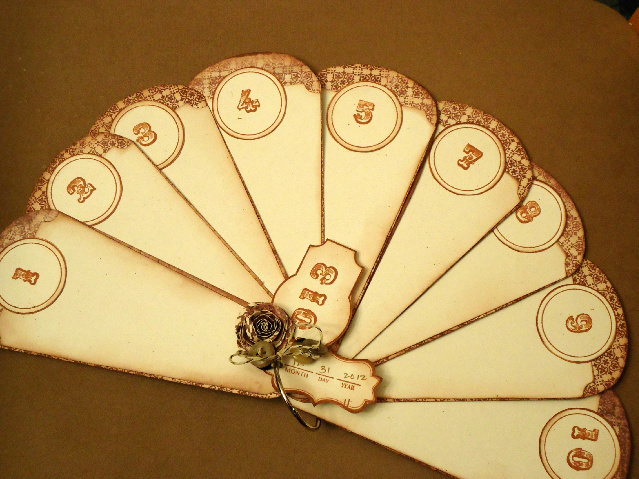 You can make them with a few items from your house! I used an empty paper towel roll cut into 2-3 pieces, but individual toilet paper rolls work perfectly. I just didn't have any on hand at the moment. 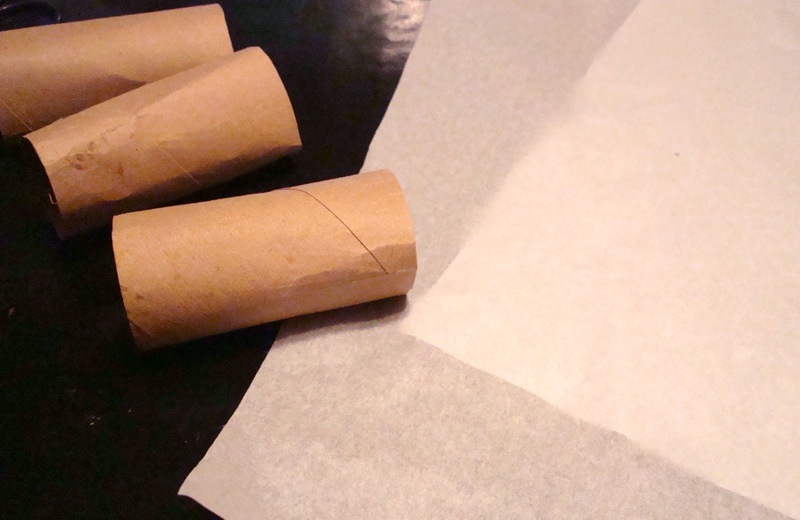 You will also need half sheet of tissue paper. 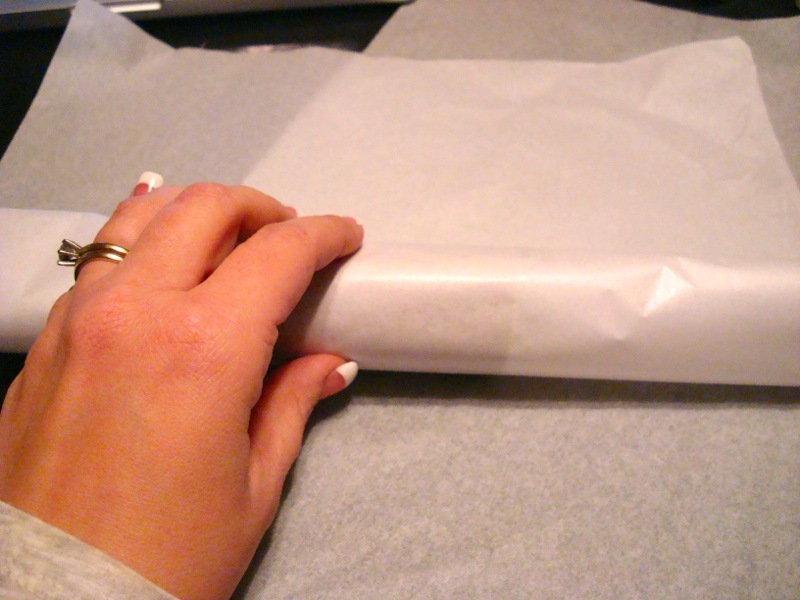 I had lots of that left over from Christmas wrapping so I cut one in half and used one piece per popper. 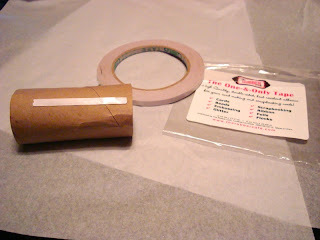 I used the One & Only Tape to hold one end of the tissue paper onto the tube. Since it is double sided, it works great for this purpose. Roll the tissue paper up and tape the end. 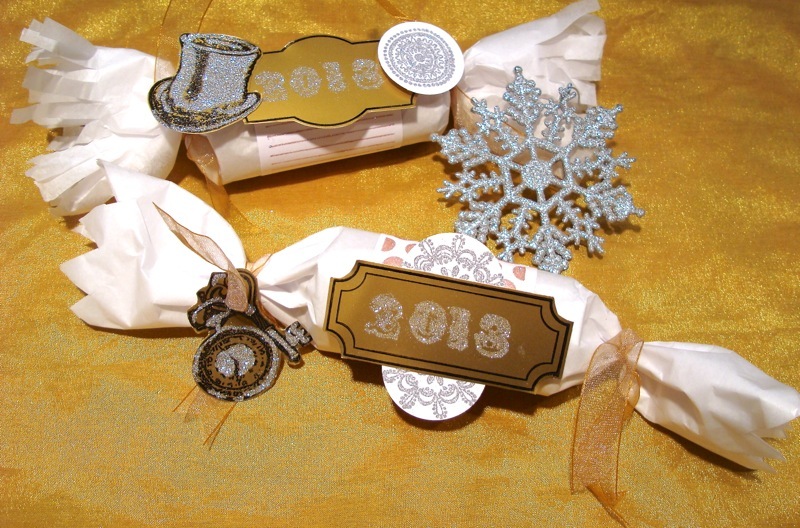 You are ready to make your embellishments now. Using a piece of metallic gold cardstock, I stamped a Card Label for each popper. 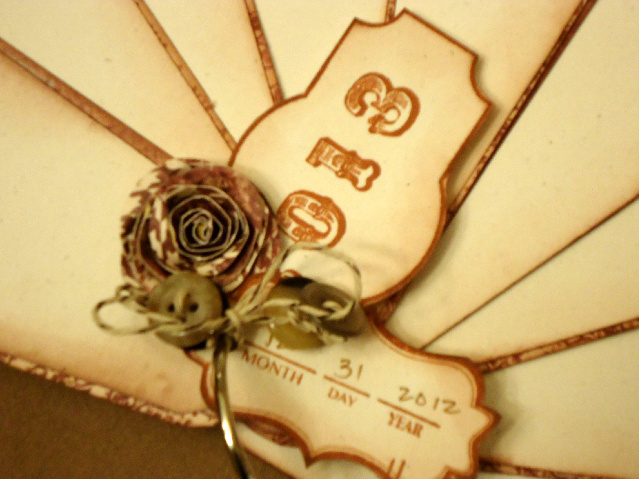 I used StazOn because the cardstock was glossy. Cut out the label with scissors and then stamp some decorative pieces too. I used the Steampunk stamps to add a top hat and watch in the black ink and cut them out. Next, I stamped Background Basics 2 onto white cardstock using Scrap Happy Glue and a dabber. 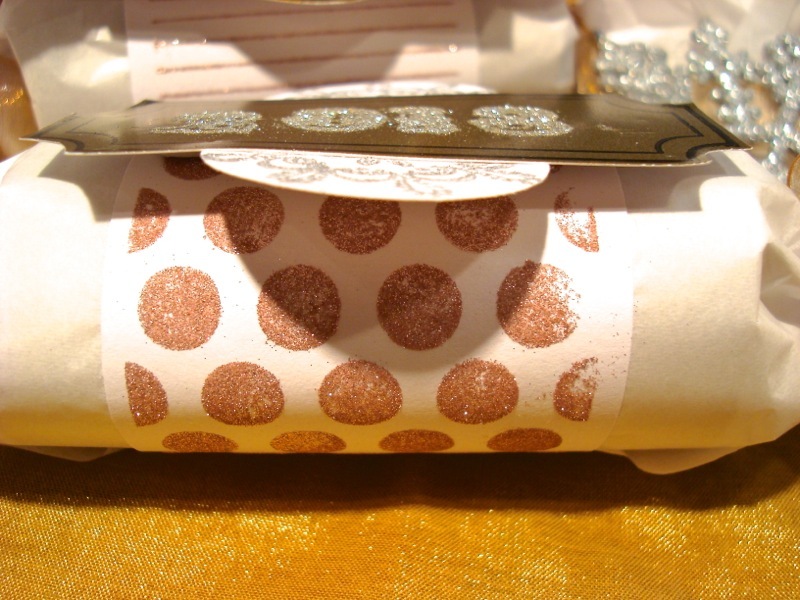 I covered the stamped area with You're So Fine glitter. Add One & Only Tape to one end and wrap it around the tube. 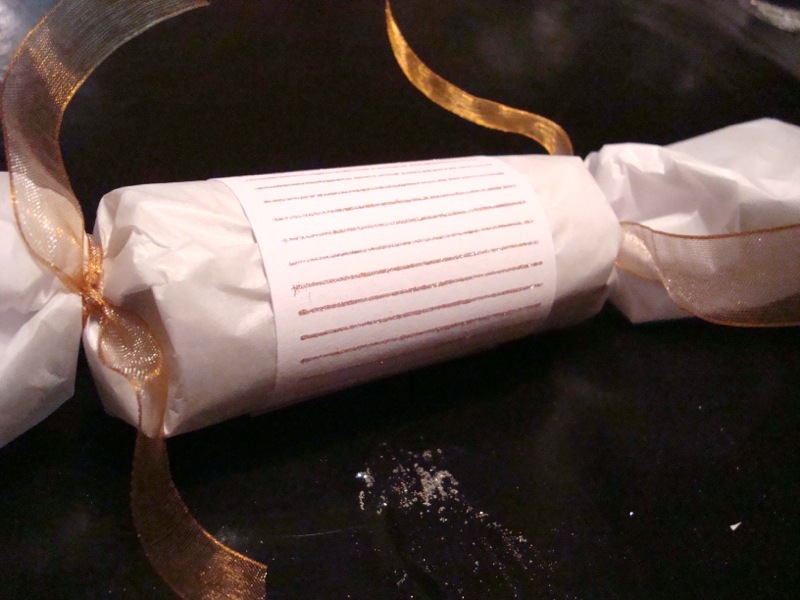 Tie the ends with some gold ribbon. Here are the cute top hat where I added glitter using Scrap Happy Glue in some areas on the image. 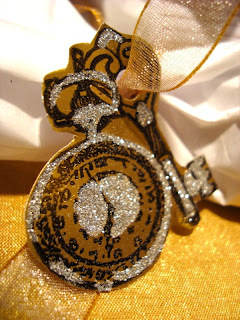 I love how the silver glitter looks against the gold paper. 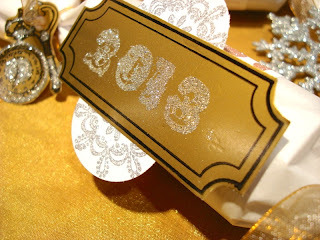 I also stamped the year using the new release Remember The Moments stamp. 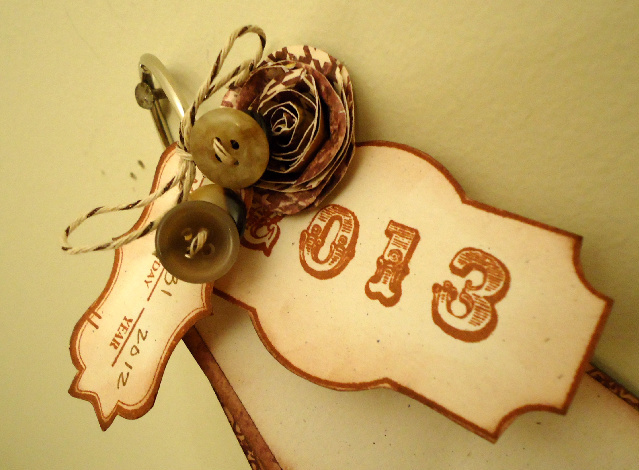 I just used the glue on each individual number and stamped it so that I could make 2013. I added the Grandma's Doilies because I thought it looked like the Times Square ball! I just glittered it and now I'm ready for the ball to drop! 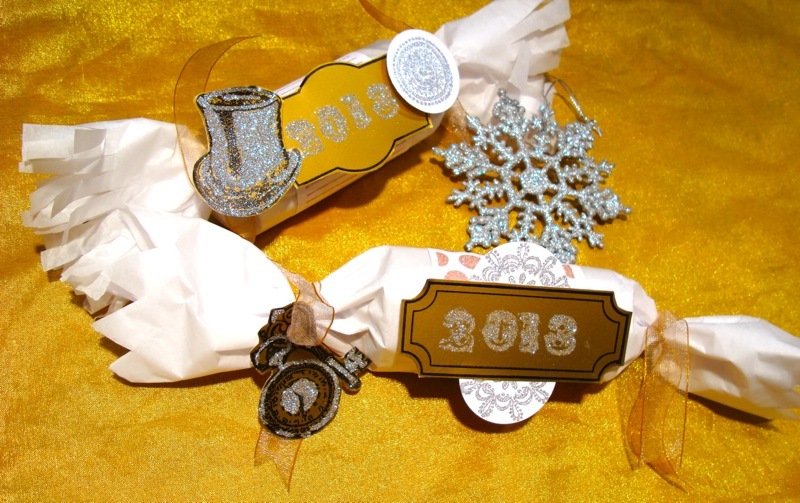 I hope you were inspired to make this fun project for New Year's dinner or a party favor! I filled mine with chocolates and gum. My kid's favorites! I can't wait to ring in the New Year with them and I hope 2013 is the best year yet! Hi Everyone - I'm back today to share a card with you that is not only full of fun bright colors, but loaded with layers as well! 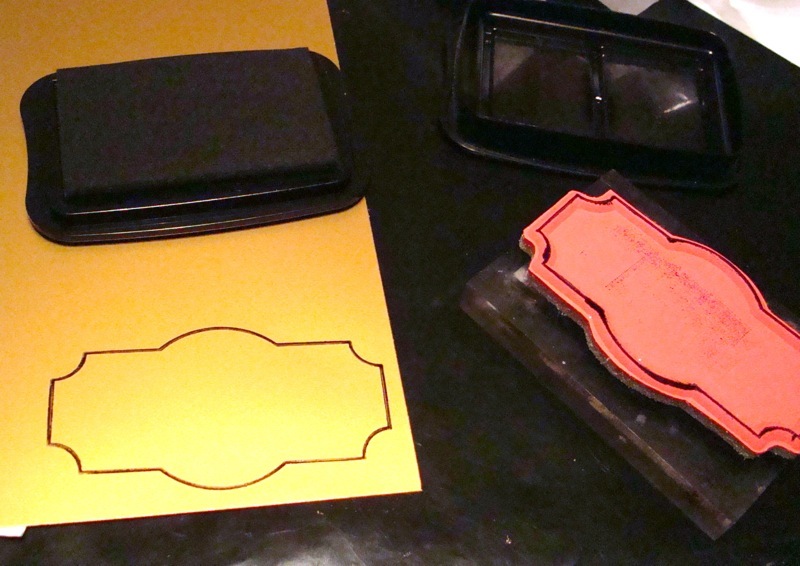 I started my project by first creating my own patterned paper on each of the panels used in my card. 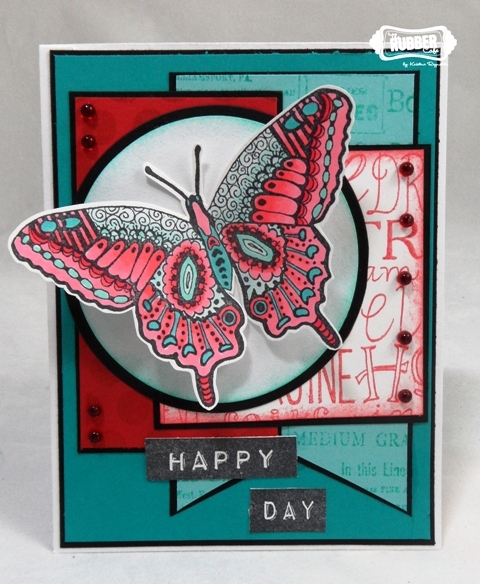 I stamped th Roaring 20's Placard on the light teal panel in teal ink. 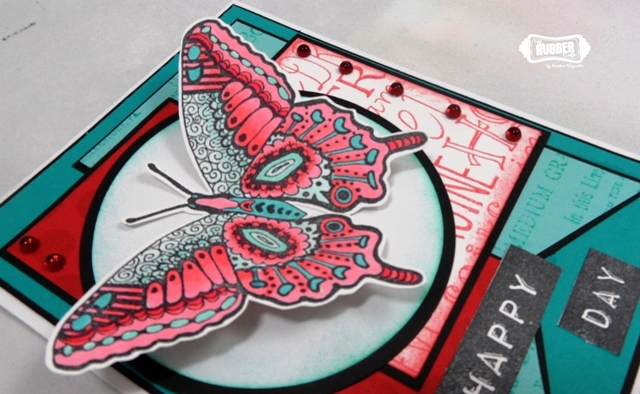 Next I stamped the polka dots from Background Basics 2 in red ink on red cardstock, which I used for the second panel. The third panel was created by stamping Words of Inspiration with red ink on white cardstock. 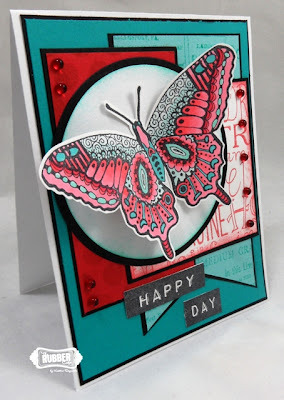 I stamped our Large Paisley Butterfly in black ink on a white Pugnacious paper, and colored with alcohol markers, fussy cutting out the butterfly I attached it to the card with pop dots. 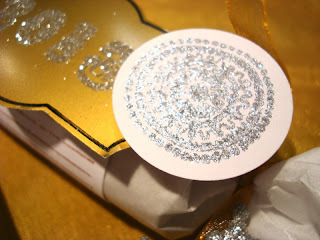 Finally I added Holly Berry Jellie Dots to the card for a little added bling. The Happy Day words are from one or our new releases, Pictures Framed. I hope you enjoyed today's card and that you are getting a little time to stamp during the holiday's! 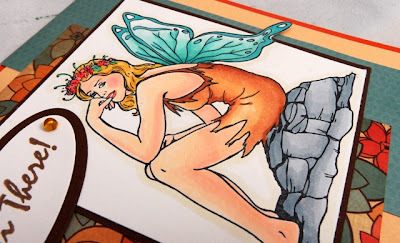 Today I have a simple card to share with you today that I made with the stamp Fairy on Rocks by The Rubber Cafe! First I colored her with alcohol markers and then cut the image panel into a rectangle leaving part of her wings "out of the box". Here's a closer look at the Fairy. I adhered all my paper layerswith Scrap Happy Glue. The sentiment is Hi There from The Rubber Cafe. 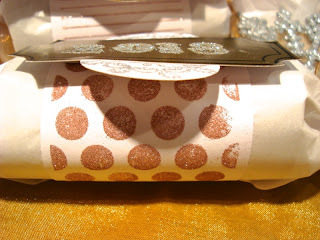 I added a Golden Jellie Dot on each side of the sentiment for a little added fun! Here's another look at my card! The Rubber Cafe' has lots of fun Fairy and Fantasy stamps available, check them out here!